I'm going to be honest, I'd been dying to read A Boy Made of Blocks ever since I received an email from the publisher telling me about it. It was about a topic that I didn't know much about and that I hadn't read about before and I was intrigued, majorly. I couldn't wait to be educated and enter a world that I had no clue about. A Boy Made of Blocks is about thirtysomething Alex, who is struggling. Struggling to keep his marriage to wife, Jody together, struggling to get his life on track and struggling to understand and bond with his son, Sam, who is autistic. After separating from Jody on a trial separation, he moves in with best friend Dan and is soon on a mission to right all his wrongs. Top of the list, is understanding Sam. As Sam introduces Alex to the game Minecraft, it soon starts bringing them closer and maybe this broken family can get back together. First of all I'm going to say that this book took me on an emotional journey! It evoked all sorts of emotions within me. One moment I was happy, the next angry, the next confused and then the next I was sobbing. It really does tug on your heartstrings. 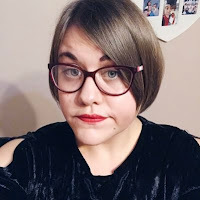 For someone who didn't know a lot about Autism it really did open my eyes to how hard it can be for both children and their parents and also what to look out for and how to learn how to deal with children on the spectrum. Although it was fiction, I was taken on an educated journey. I'm not a big gamer, and to be honest I've never even played Minecraft but I loved how it was woven into the storyline and became a huge part of it. I enjoyed reading about how Alex and Sam bonded over it and how ultimately it helped them understand each other. It was really unique and something that I hadn't read about in any book before. When they were playing it it was like they were in their own little world and no one could enter and break what they had. It was really heartwarming to read about. In my opinion it goes to show that things like games can bring people together and change lives, despite the negative press that they sometimes get. Alex, as a character was quite hard to understand at first. At the beginning you don't get much of his backstory and why he acts the way he does. However, as the book progresses you get to know him inside out and that's when you start to realise why he is the way he is. I felt quite sorry for him at times and just wanted to help him sort his life out. Sam, oh my god I loved him! Whenever he was a part of the story it was like I could imagine him as a real person. He was very realistic. Yes, he had times when he wasn't the best but you gradually start to understand him and I just found him to be really cute! He is a real sweetheart and in the end in my opinion he is the hero of the story. A Boy Made of Blocks was an outstanding read! It was eye-opening, heartwarming and educational. I literally couldn't stop reading it. The storyline was unique and unlike anything I'd read before and the themes throughout kept me intrigued and hooked. I also love how it was based of the author's own experiences with his autistic son. This added to the realism of the book and is probably why the theme of autism was explained in a detailed, exceptional way. 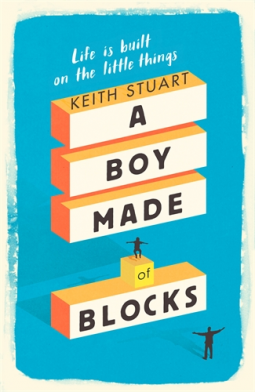 Keith Stuart, author of A Boy Made of Blocks, is games editor at The Guardian. 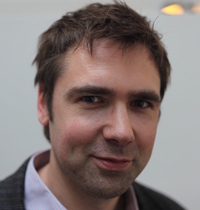 He started out as writer and features editor on the highly influential magazine Edge, before going freelance in 2000 to cover games culture for publications such as The Official PlayStation Magazine, PC Gamer, and T3, as well as investigating digital and interactive art for Frieze. He also writes about music, film and media for The Guardian, and is a regular on the Tech Weekly podcast. He is married with two sons.